Our two apartments are located on the ground floor of a beautiful house with a large plot in a beautiful location in quiet surroundings with attractive views of Riva del Garda and the northern Lake Garda. The third apartment (the studio Chic and Wild) is located 15 meters from the house. 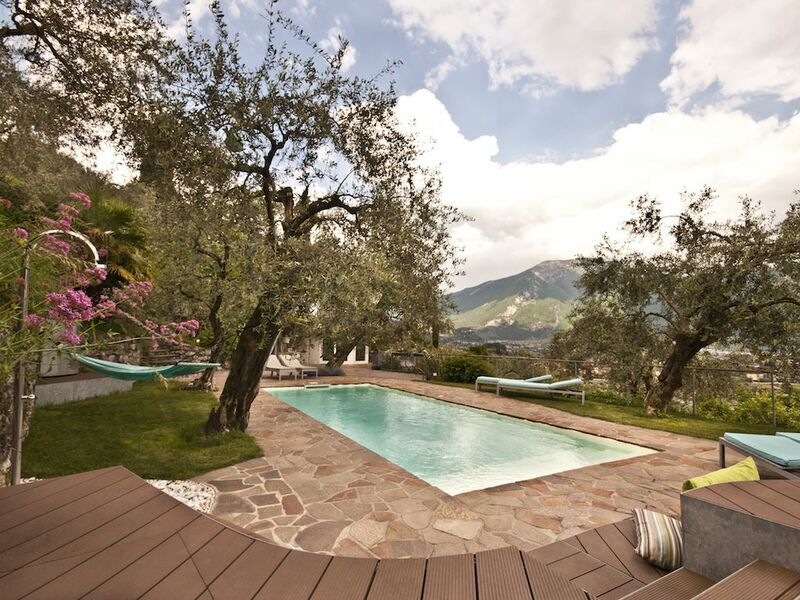 Casa Falu is surrounded by a ca 2200qm large terraced garden with centuries-old olive trees. Apartment IDA: (in the photos the right apartment) with 2 bedrooms with a double bed, bathroom with shower, living / dining room with kitchenette: SAT TV-LCD and Wi-Fi. Apartment ADA: (in the photos on the left side at ground floor), approx 40sqm. With beautiful shower room and kitchenette. SAT TV LCD and Wi-Fi. Studio and CHIC WILD: In the midst of olive trees, 15 meters from the house, is our studio with its own terrace and a covered outdoor kitchen. Architecturally very attractive, bright and surrounded by nature with views of the lake and the surrounding mountains. In Studio: double bed, shower and toilet, TV-SAT, WiFi, covered in glass outdoor area is a modern kitchen with integrated seating area. Space in our garage for their bikes a MTB washing area is available. All apartments have been completely renovated a year ago, the furniture is new and everything was very neat: On the large terrace with panoramic views you can have breakfast, eat, or enjoy a good glass of wine. A marquise protects them at will from the sun. Washing and drying machine are benützbar. Parking for several cars is also available. In addition to the garage, you can wash your MTB. Distance to the city center of Riva del Garda is 2.5 km away. Until Tenno about 7 km. Up to m Ledrosee about 9 km .. Directly from here you can take a relaxing walk or mountain bike excursions and then dip in the pool in front of the house. Lake Garda can easily be reached by bicycle on the nearby bike path. Bed linen, hand and shower towels, and kitchen towels are provided and included in the price. MTBIKERS AND ROAD BIKERS are especially welcome. We have the ability to provide a shuttle service with our VW Multivan with trailers. We can also meet you at the airport or train station you. Für zwei Wochen genossen wir im Juli 2015 einen wunderschönen Familienurlaub mit zwei jugendlichen Kindern im Casa Falu (Wohnung Ida). Äußerst geschmackvoll mit Liebe fürs Detail eingerichtet, kann man sich hier nur wohlfühlen. Mitten im Olivenhain in erhöhter Position gelegen, entflieht man dem Trubel von Riva del Garda. Auf der Terrasse hat man einen herrlichen Panoramablick auf den Gardasee. Erfrischung und Spaß bieten der stets saubere Pool mit Sonnenliegen und Hängematten nebenan. Abends lädt der Whirlpool zum Relaxen ein. Eine stimmungsvolle Garten- und Poolbeleuchtung sorgt für ein besonderes Ambiente. Alles ist sehr gepflegt, hochwertig und bei Fragen, Tipps und Empfehlungen sind Fabrizio und Luisa immer sehr freundlich und hilfsbereit. Casa Falu ist ein ganz besonderer Tipp für einen Urlaub in Riva del Garda. Irgendwann kommen wir bestimmt wieder! Ellen und Christoph M.
We stayed in the Ida apartment for 6 nights and it wasn't long enough. We loved our time here and would definitely go back. We are a family of 4, 2 adults and 2 children aged 8 and 10 and the apartment was ideal. Although small it didn't matter as we spent all our time in the pool, hot tub or on our balcony. We ate all our meals on the balcony with a beautiful view of Lake Garda. Thank you and we highly recommend these apartments! We rented both apartments for a week in June and really enjoyed our stay. The apartments were modern with a high quality finish and very clean. The garden with pool and hot tub was lovely, clean and very well maintained with plenty of outside furniture for both apartments. We really enjoyed the peaceful location not too far from town with an easy 3km walk along a lit cycle path from Riva centre. My husband and I shared the open plan Ada apartment which was very spacious for two people. My friends and their young children stayed in the Ida apartment which was ideal for a young family. Both apartments were well equipped. The owners were very friendly and couldn't have been more helpful. The layout of the apartments offered plenty of privacy from the owners home on the top floor. We will definitely be recommending these apartments to friends and family and hope to return ourselves too. Very close to the house is a Splielplatz for children (200mt.) And a bike path directly to the lake. The house is 400 mt. up to a market with nice selection of bread, post office, butchers, fruit and vegetables, church and bank. If you love hiking, you can start directly from the house several walks. Bicycles and MTBikes find space in our garage. Tenno is only 6 km. From here and Ledrosee 9km. Lake Garda is 2. 5 km.